Same organizations, same rhetoric, same globalist agenda, different country. Bangkok, Thailand May 17, 2011 - In Egypt before the January 2011 globalist-funded mobs took to the streets destabilizing the country and making way for Mohamed ElBaradei to worm his way into power, he spent the preceding year building up his street mobs and his political front, while his globalist sponsors began setting the rhetorical stage. Under the radar of most of the world, ElBaradei and his "National Front for Change" had all the ingredients of a festering foreign-backed color revolution. His membership upon the globalist International Crisis Group should have been a warning to all geopolitical analysts, and was a feature overlooked by many even after the color revolution was well underway from January onward. What if the alternative media noticed and began reporting on this nefarious gambit a year, or even months before the "Arab Spring" unfolded? Perhaps Egypt was a missed opportunity to expose and thus balk the globalist agenda. However, highly contested elections are preceding the next phase of yet another globalist-fueled gambit, this time in Southeast Asia's Thailand. It bears all the hallmarks of ElBaradei's disingenuous campaign and run-up to the color revolution in Egypt. With the facts in hand, there is a possibility to raise awareness, get ahead of and balk yet another wave of globalist-sponsored geopolitical destabilization. Thailand's opposition party is led by long-time globalist conspirator Thaksin Shinwatra, a former adviser to the Carlyle Group, who was literally standing in front of the CFR in NYC on the eve of his ousting from power in 2006. Since then, he has been represented by some of the largest lobbying firms on earth, including fellow Carlyle man James Baker and his Baker Botts law firm, the International Crisis Group's Kenneth Adelman and his Edelman Public Relations firm (also a corporate sponsor of the "color revolution college" Movements.org), and Belfer Center adviser and IISS trustee Robert Blackwill of Barbour Griffith & Rogers. 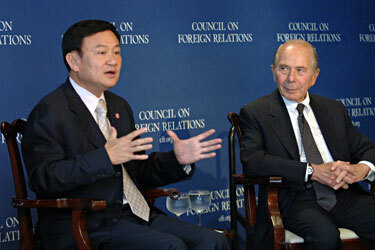 Long-time globalist minion Thaksin Shinawatra is shown here during his September 18, 2006 talk before the Council on Foreign Relations in New York City. The next day the Thai military would depose his government from power in a bloodless coup. With the help of the globalists' vast networks he has divided and destabilized Thailand ever since. Currently, Thaksin is represented by Robert Amsterdam of Amsterdam & Peroff, a major corporate member of the globalist Chatham House. Robert Amsterdam is concurrently defending Thaksin's "red shirt" street mob as well as the imprisoned Russian oligarch Mikhail Khodorkovsky. Khodorkovsky attempted to consolidate and handover Russia's resources to foreign bankers, most notably Jacob Rothschild who was sitting as a board member within his Soros-style "Open Russia Foundation." Thaksin himself had attempted a similar consolidation and hand-over, including a foiled 2004 US-Thai FTA that he tried to pass without parliamentary approval. Many of the corporations that stood to gain from the US-Thai FTA (listed here on page 8) are also involved in the many groups not only still supporting Thaksin's bid for power today, but engaged in a global agenda pursuing military and economic hegemony. For two consecutive years Thaksin, his globalist backers, his proxy political party, and his "red shirt" street mobs have attempted to oust the current government with increasingly violent "people's revolutions." In 2009, riots broke out as Thaksin phoned in from his Dubai resort proclaiming, “now that they have tanks on the streets, it is time for the people to come out in revolution, and when it is necessary, I will come back to the country.” The rioters would gun down two Bangkok residents before the Thai army was able to disperse the protests. 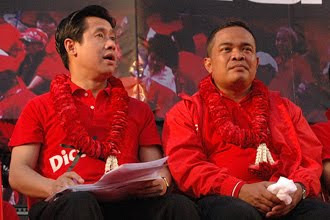 Jakropob Penkair (left) and Jatuporn Prompan (right) are two long-time associates of the globalist Thaksin Shinawatra. Jakropob had declared in 2009 the beginning of a suspiciously Communist-sounding "People's War." Jakropob is assumed to be hiding in Cambodia, while Jatuporn is currently residing in jail on terrorism-related charges for his role in leading last year's deadly riots. JAKROPOB PENKAIR: The confronting issue is that how the movement would get its support. And in the past year it proves that its support could come from elsewhere. It doesn't have to come from Kun Thaksin and his family or his assigned people. ZOE DANIEL: Are you talking money now? JAKROPOB PENKAIR: Talking money, talking about the safe place to stay, talking about the co-operation of respective government in the countries that we visit or stay - all those things. We have been receiving, in a more natural way than before - in other words, we have had such a controlled system before, and then it's quite a relief to see that in the past year, there are a lot more universal support too of course, but we have the duty to make it clearer to the people out there, especially foreigners. ZOE DANIEL: So, you're saying that others are donating financially to the cause to keep you going? JAKROPOB PENKAIR: Yes. Yes, they have. ZOE DANIEL: Internationally as well as Thais? After the contrived "Arab Spring," the 30 years of armed insurrection in Libya now re-branded as a peaceful, spontaneous pro-democracy revolution, and considering the laundry list of globalists backing Thaksin since 2006, Jakropob's words are all too familiar and indicative of yet another globalist gambit unfolding in yet another sovereign nation. Jakropob would go on to say in a separate interview that a "people's war" had begun. Other sources claimed that small-arms have been moved into Thailand from Cambodia for increasingly violent operations. On April 10, 2010, these threats would be made good on, as militant groups came out to balk army efforts to once again disperse the protesters, killing 7 soldiers in one night, including an army colonel, and tipping off a month of sporadic gun battles and grenade attacks. After initial denials that the protesters were involved in armed violence, the international spokesman for the "red" protesters, Sean Boonpracong, admitted to Reuters that elements of the army were with their movement, including the black-clad mystery gunmen that took part in the April 10 bloodbath. The suspected leader of these gunmen, renegade general Khattiya Sawasdipol, known as "Seh Daeng," admitted to commanding 300 armed men trained for ''close encounters'' and carrying M79 grenade launchers, before withdrawing his comment in later interviews. From April 10, 2010 until the widespread arson that marked the end of the protests on May 19, 2010, daily and nightly gun battles, grenade attacks, and sniper fire would claim the lives of 91 people. This included 9 soldiers and police, a woman killed by an M79 grenade attack, and at least one protester who died of smoke inhalation while looting a building fellow protesters lit ablaze. The remaining 80 deaths included journalists, bystanders, medical workers, and protesters caught in the crossfire. While protester to this day attempt to portray these events as a massacre of "91 protesters," it is quite clear that the military was up against an armed wing working amongst the protesters, admitted by members of the protest leadership themselves. Widespread protests were headed-off this year with the call for fresh elections in July 2011. However, it is more than likely Thaksin and his proxies will not be allowed to seize back power, and the cycle of violence will ensue, complete with increasing international support on Thaksin's behalf. What Sort of International Support? 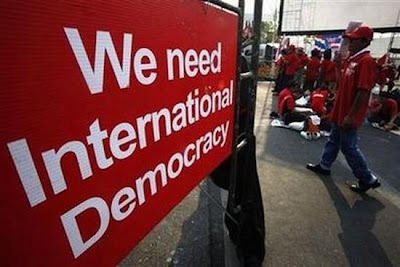 The now notorious National Endowment for Democracy and Freedom House organizations, implicated for their involvement in orchestrating the "Arab Spring," along with the International Crisis Group have all contributed to the "red" color revolution in Thailand as well. Just as they have in Egypt, Syria, Libya, and Belarus, these nefarious organizations have leveraged an incredibly disingenuous concern for "human rights," "democracy," and "freedom" to pressure the Thai government internationally as Thaksin's political proxies and street mobs pressure the government from within the nation. 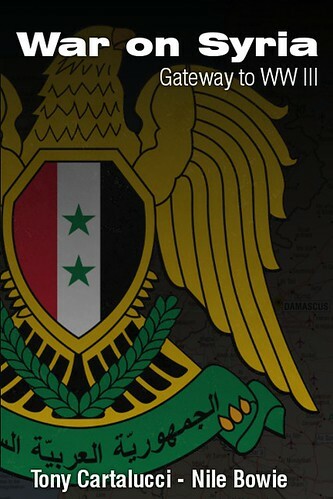 Suspicious signs repeating almost verbatim calls made by overtly foreign-funded movements in Egypt, Libya, and Syria. 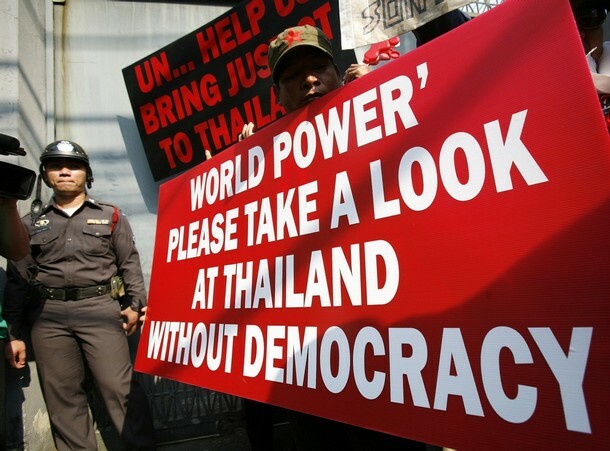 "UN Help Us Bring Justice to Thailand," "World Power Please Take a Look at Thailand Without Democracy," and "We Need International Democracy." These organizations, along with Human Rights Watch and a myriad of other "international arbiters" supply a steady stream of metrics to be cited by Thaksin's political agents and propaganda machines on the ground. They are also used by the globalists' corporate-owned media to muddy Thailand's international image, opening the door for potentially more overt interventions as seen in nations like Libya, Syria, and Iran. Often cited is the Freedom House's "Freedom in the World" report where Thailand was downgraded from free under the globalist-friendly cleptocratic Thaksin regime, to partly free under the current Thai government who has been steadily distancing itself from free-trade with the US, ignoring US calls to enforce "intellectual property," and pursuing a more protectionist policy in regards to the West and its unraveling economy. What those who cite Freedom House forget to mention is that upon its board of trustees sits Kenneth Adelman who was Thaksin's former paid lobbyist. Such a conflict of interest derides Freedom House's legitimacy entirely, and similar personalities and corporate sponsors involved in the organization have also directly benefited financially from conflicts started on lies given legitimacy through Freedom House's "work." These include both George Soros and many of the signatories of the war mongering Project for a New American Century. 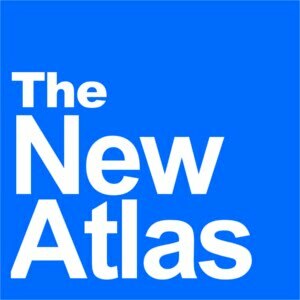 The National Endowment for Democracy (NED), is on-record funding "Prachatai," a Thai propaganda outlet promoting a variety globalist agendas, linking to sites such as Soros-funded "Open Democracy," Soros and Ford Foundation funded "Global Voices," the globalist International Institute for Strategic Studies (which includes Robert Blackwill, former Thaksin Shinawatra lobbyist), as well as a myriad of pro-Thaksin, pro-globalist, pro-red shirt websites that form the nucleus of the movement's intelligentsia. Prachatai is also the recent recipient of the contrived "Courage in Journalism Award" bestowed by the globalist-funded "International Women's Media Foundation (IWMF)." Some of IWMF's corporate supporters include Bank of America, Chevron, Northrop Grumman, and Merril Lynch. It would be misguided if not completely naive to believe these corporations have any interest in promoting "courage in journalism." Rather, they are attempting to legitimize what is in reality, foreign-funded, subversive propaganda working on their behalf for their own self-serving interests. Another often cited organization used to pressure the Thai government is Reporters Without Borders, funded by the corporate-lined National Endowment for Democracy, which has downgraded Thailand as well regarding it as a "nation under surveillance." The organization cites the crackdown on the very elements involved in the foreign-backed "red" color revolution as the reasoning behind its judgment, using the NED funded Prachatai website in particular as an example. Reporters Without Borders attempts to portray such crackdowns as an affront to freedom, even as Secretary of State Hillary Clinton openly admits to funding subversion through these very organizations worldwide. Freedom House is a big fan of NED funded Prachatai as well. Prachatai is an over-the-top propaganda clearinghouse for the Thai red color revolution. Transparency International is yet another source frequently cited by the Thai "red" color revolution. The organization downgraded Thailand's score on the contrived "Corruption Perception Index" from 3.6 under Thaksin to 3.4 under the current government. Transparency International, however, is funded by perhaps the most corrupt corporations on earth, in human history, including: Anglo American, Ernst & Young, Exxon Mobil, General Electric, Merck, Procter & Gamble, Shell International, Abu Dhabi National Energy Company, and Wal-Mart. Foundation support includes the eugenicist Bill & Melinda Gates Foundation and the criminally run World Bank. It should be intuitive that organizations funded by such self-serving corporate-financier interests are entirely disingenuous, their agenda's completely compromised, and their work entirely subversive. It should also be intuitive that corporations like Exxon and Northrop Grumman are not interested in Thailand's "democracy," "freedom," or "human rights." They are simply leveraging these ideals before an impressionable audience in order to expand the global elite's military and economic hegemony throughout the region. The International Crisis Group, in their April 11, 2011 report, "Thailand: The Calm Before Another Storm?" concludes that "even if the elections are free, fair and peaceful, it will still be a challenge for all sides to accept the results. If another coalition is pushed together under pressure from the royalist establishment, it will be a rallying cry for renewed mass protests by the Red Shirts that could plunge Thailand into more violent confrontation." Just as in Egypt, ElBaradei's "National Front for Change" lost elections and subsequently took to the streets claiming the polls were unfair. They were determined to seize the nation through ochlocracy with the backing of their globalist sponsors. Likewise in 2009 after elections in Iran, the admittedly US-funded "green revolution" took to the streets to override elections they claimed were illegitimate. Upcoming July, 2011 elections in Thailand will play out in a similar manner. It is highly unlikely Thailand will accept a win by Thaksin's proxy political party, now run by his own sister, Yingluck Shinawatra in a shocking display of overt nepotism. Thaksin himself is a convicted criminal and a fugitive operating out of Dubai. He has a two year jail term sentenced to him and yet he still openly decides matters for Thailand's opposition party as its leader. He also often calls into "red shirt" political rallies giving out dictates and describing the party's agenda. His image is frequently used on party billboards to draw off of his "cult of personality." Combined, it would be almost unthinkable to allow such overt criminality to seize back power, no matter what the polls decided. However, Thaksin's political party, rife with infighting, overt corruption and nepotism, and many of its party members facing trials and jail time for their role in last year's violence, most likely will not form the ruling government within Thailand's parliamentary system. Despite being a fugitive with a 2-year jail sentence, Thaksin Shinawatra openly dictates Thailand's opposition party's agenda from his Dubai resort. His image is tapped for what is essentially a "cult of personality" that has been meticulously developed over the years. Thaksin's sister, Yingluck Shinawatra is now leading the party as her brother's proxy, in a shocking display of overt nepotism. 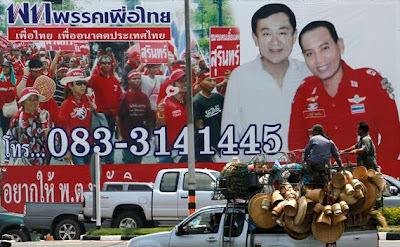 The amount of time, energy, and resources poured into Thaksin, his proxy party, and his street mobs by his Western backers are surely not going to end because of unfavorable results during the upcoming polls. In fact, we can expect, just as in Iran and Egypt, the remaining resources on hand to be pumped into massive street protests and unprecedented levels of violence. Unlike in Egypt however, where events took many by surprise, we have the fraudulent "Arab Spring" as our historical model to gauge future events by, including destabilization growing in Thailand, as well as in Belarus, Myanmar, and even Pakistan. With this knowledge in mind, awareness can be raised and these gambits potentially balked. Once the disingenuous nature of this revolution is exposed, the nefarious money and organizations behind it revealed, this will be one less tool the globalists will have to menace and dominate the planet and its people with. UPDATE: June 9, 2011 - More documents have been found regarding Thaksin Shinawatra's extensive support provided by some of the largest lobbying and law firms on earth. The US Senate maintains a lobbying disclosure database that can be searched providing irrefutable evidence that Amsterdam & Peroff, Baker Botts, Barbour Griffith & Rogers, and Kobre & Kim have provided their services to Thaksin Shinawatra. The Barbour Griffith & Rogers lobbying registration literally states under "specific lobbying issues," that the firm will, "provide strategic counsel on U.S. government policy and assist with advancing the individual's desire to promote democracy in Southeast Asia." With everything learned from watching the contrived "Arab Spring," BGR's assistance with advancing Thaksin's "desire to promote democracy in Southeast Asia" is quite obviously the continuation of the Thai "red" color revolution. The Baker Botts lobbying registration states that the firm will, "develop and implement a strategic approach to the various internatioanl legal and political issues that confront Dr. Thaksin due to the coup of September 19. The firm will monitor the evolution of US polices towards the interim government in Thailand or the Administration's position regarding attempts by Dr. Thaksin's return to Thailand and may subsequently undertake contacts as necessary to ensure that such policies remain consistent with those currently in place." Openly, the influential, politically connected Baker Botts firm is talking about ensuring US policy aligns with both their own agenda and the agenda of their client. In 2007, the New York Times references Thaksin's relationship with James Baker in an article titled, "Chasing Thaksin's cash carries risk for Thai generals," where it states, "Thaksin seems to be contemplating using connections abroad to pressure the junta. Baker Botts, his law firm in the United States which is tied to JamesBaker III, a former U.S. secretary of state, issued a statement Monday decrying the asset freeze. It showed that "Thailand remains in the grip of military rule that is divorced from the rule of law," the firm said." Additionally, the US Department of Justice maintains the Foreign Agents Registration Act (FARA) database where Thaksin's registration under Daniel Edelman of the Edelman PR firm can be found. FARA is described on the website as, "a disclosure statute that requires persons acting as agents of foreign principals in a political or quasi-political capacity to make periodic public disclosure of their relationship with the foreign principal, as well as activities, receipts and disbursements in support of those activities." This confirms previous statements made regarding the political, rather than legal nature of the work being done by current Thaksin lobbyist, Robert Amsterdam.